← Halloween Book Hop–Tricks and Treats for Everyone! Several of the literary agents who took the time to formally reject the thing pointed out that the story had no discernible plot, and some noted that most of the characters were cardboard. At least one asked what the point of the whole thing was. And was there any lesson or message that the reader should take away? Well, no! It was literary fiction. And isn’t literary fiction supposed to keep you guessing? You can see where this is going. I’d written over three hundred pages of utter crap. It was fun, though. While my kids had been in preschool, I’d sat on the couch hacking things out, day after day. Hmm, what should I write today? Oh! I know. I’ll write a chapter about a man and woman having dinner in a restaurant, but I’ll make it read like a lost episode of The Twilight Zone. Yeah. That’ll be cool. And it’ll be a nice contrast with the previous chapter, in which the man seemed totally normal, because in this chapter, he’ll be acting bizarre. Why so bizarre? Hmm. Maybe he’s on drugs, or maybe he’s just got a strange personality. Or maybe he’s a criminal! It would have to be up to the reader to figure things out, because the writer sure as hell didn’t have a clue. Yes, this is embarrassing for me to admit, but that’s how I thought bestsellers got written. Years earlier, I’d fallen in love with movies like Blue Velvet, and had been left with the very arrogant impression that I could write something like that if I just took the time to do it. As if! Anyway, one day in 2007 as I sat at my computer reading yet another rejection letter, my doorbell rang. It was a friend dropping something off, and when I told her of my difficulty finding a literary agent, she told me she had a personal connection with a very good and successful one. She and the agent weren’t exactly friends, but acquaintances, and maybe if I queried her, I’d get a better response. I wrote to that agent immediately, and was surprised when she replied quickly, saying she’d like to see the first chapter. Excited, I sent it. A few days later, the agent wrote back, asking for another chapter or two. Then, she requested the full manuscript. And that’s when I “made it.” In my head, of course. I’m not sure why I became so convinced that this was going to be it, but I did. The truth is that the beginning of the manuscript wasn’t so bad—especially since there was no real indication as to where it was headed—and other agents had also requested additional pages after reading the first couple of chapters. But this agent came with a personal connection, and, of course, I was tired of querying. I should also mention that the holiday season was fast approaching, and I’m sure the agent was busy with holiday stuff. In any case, throughout November and December, I didn’t hear a peep from her. But instead of being rational and assuming she had other things on her mind besides my silly manuscript, I assumed she was crazy about it. She’s probably reading and rereading it, trying to figure out how to sell it at the highest price. Or maybe she’s talking to film producers already. My holidays, therefore, were pretty good. I went to various parties and events feeling a true glow inside. By next holiday season, I’d think, I might be up for an Oscar! Or no, maybe not next year, but the year after, because it takes a while to make a good movie. When people asked what I’d been up to, I’d tell them I’d finished a manuscript and had my fingers crossed about something really big. And each time I’d say that, I’d believe a little more strongly that my story was going to explode—in a good way. And here’s the hardest part for me to admit. I developed something of a haughty attitude. I’m normally a pretty humble person, but the prospect of becoming a superstar brought out some undesirable aspects of my personality. Sometimes, I’d just waste time fantasizing about the dresses I’d wear on the red carpet, but other times, I’d actually think of myself as a cut above my friends and fellow writers. After all, they were still working at normal jobs, raising families, or hacking away at short stories, screenplays, or novel manuscripts. But I was Hollywood bound. Then, one Friday in January, I woke up feeling anxious and shaky. And later in the day, things got worse. Terrifying, disgusting, and shocking thoughts kept going through my mind and getting stuck there. I truly believed I was having a breakdown of some sort, and made an emergency call to my therapist. She agreed to see me first thing Monday morning, and helped me understand that I was suffering from a common anxiety symptom called obsessive thoughts. She also gave me some good strategies to stop those thoughts from controlling my life, and assured me they’d go away if I practiced the strategies. But of course, she also asked if I was particularly stressed about anything. I told her about my “prospective book deal,” (imagine that!) and the movie deal I was also hoping for, and she asked if I was worried about what fame might mean for my family and me. And the more I thought about it, the more I realized that not only was I terrified of fame, but of what it was already doing to me. Who was I becoming? What had happened to regular old Mary? And what would happen if my fantasies became reality? Well, as you might guess, I never found out. A few days later, the manuscript appeared on my doorstep, along with a lovely note from the agent, explaining why the story wasn’t working for her. Of course, I cried. And questioned, and screamed a bit. But eventually I paid attention to what her note actually said, and realized I had a lot of work to do. I went back to the drawing board, starting a new manuscript, but also reading lots of books about plot and character development. I read novels and watched movies critically, paying attention not only to the stories, but how the writers conveyed those stories. But as all that was happening and I began to write more purposefully, I also grew increasingly aware that my idea of “making it” as a novelist was pretty screwy. Yes, I’ve now got a wonderful agent and publisher, but what I really want is to become a better writer each day. Because writing isn’t about making money, or winning awards, or walking red carpets. Sure, those things happen sometimes, but some of the best writers I know have never achieved any of that, and don’t really aspire to it. This entry was posted in literature, movie deals, novel writing, publishing, writing and tagged agents, big screen, deals, Hollywood, literary agents, movie deals, novel, novels, publishing, writing, writing for Hollywood. Bookmark the permalink. 21 Responses to How Do You Know When You’ve “Made It” as a Writer? Yes, I think you’re right – it’s personally connecting with a reader that makes it all worthwhile! Most definitely, Jan. And every time I read your blog, that’s reinforced for me. You have such a gift for connecting with readers. AWESOME! Mary, this post is so fantastic. Thanks for being open and honest and sharing your journey in a really, really authentic way. It’s one I will definitely be rereading as I stumble down my own writing path 🙂 THANKS! Thanks so much, sweet Sheila! Although you’re not stumbling! I feel so lucky to be able to read your work and know it’ll find the wonderful home it deserves soon. I love this post, Mary for so many reasons. Your honesty and candor, the heartbreak, the delusion and the joy. To put yourself out there on display, for ‘others’ to rise up and, or knock down is both courageous and horrific. To choose the life of the artist, to make a living with words in these shaky times I’m betting it boils down to luck. Lovely words, here’s to always honoring the words and letting them fly. You’re golden. As are you, my friend. Thank you for always being supportive, and of course, for writing so much truth. You’re one of the most honest, courageous writers I know. I LOVED this article! Had to laugh because my first manuscript was pretty laughably horrible too! I don’t know, Carrie! Everything of yours I’ve read has been a lot better than that first disaster of mine. A few times, I’ve thought about it for about five minutes, wondering if any part of it might be saved–even a chapter, perhaps, as a short story–but the answer is always no. Thanks, Mary. Every aspiring author should read this…once a week…for about a year. On the way to ‘making it’, there was an interruption to my progress. My wife worked in the local school district as a Special-Needs Para-Pro. She was assigned to a little girl in a wheelchair, a quadriplegic. My wife tended to all her basic (and extreme) needs, all the while acting as the teacher’s aide. One day my wife came home to describe the frustration with trying to hold up a children’s picture book with one hand, turn the pages with the other, and hold the little girl’s head up with the third arm you women get. She wished for some way to keep the girl’s attention on the words of a story, while the noisy class and the muscular disease acted to thwart every effort. Inspired, I wrote my second children’s picture book, The Magic Word. It was complete in less than four hours. Launched as an e-flipbook in .pdf, the pages can be ‘turned’ from anywhere on the page, on any tablet. Need to rotate the tablet or turn it over to the other hand? No problem, the book flips upright. Spit wipes right off…a must-have. My wife told me the next day that the little girl had never spent an entire school period so engaged. She read the book over and over again, learning three new words. However much money I make in this silly career of make-believe, it will pale to the day the little girl’s dad caught me at the school, to give a total stranger a big, tearful hug. The Magic Word and Have You Seen a Caterpillar? are free to download from my website. This is so beautiful, Patrick. Every writer should read your comment too. If anything drives home the “reason we write,” this is it. Congratulations on your book, and on the joy you brought to the world. And I hope you make some money too. You certainly deserve it. That feeling of realizing you’ve written 300 pages of crap… that’s still where I’m at with my first novel, but am getting ready to start working on it again. As an editor, I’m in my element, but have realized I need to bring my structure to my writing process or else I write too much that veers off course and does nothing for the story. It was a hard lesson to learn. Jeri, I have a strong feeling your novel isn’t crap. And IMO, the editing process is when things start to really shine. After you get everything out on the page that was in your head, then you can really look at it and figure out where the gems are. I think it also becomes easier to see what you want to cut and maybe save for another story. Have you read Robert McKee’s book “STORY”? It was recommended to me by a friend when I was working on Living by Ear, and although that book is no masterpiece–not even close–reading STORY helped me shape it into something much better than it was. Very best of luck with the novel. I know it will be terrific. I’ve not read McKee’s book, but will make sure to take a look at it. Thanks. You have to take your victories where you can find them. Just being published is enough of a victory for me, at least for now. 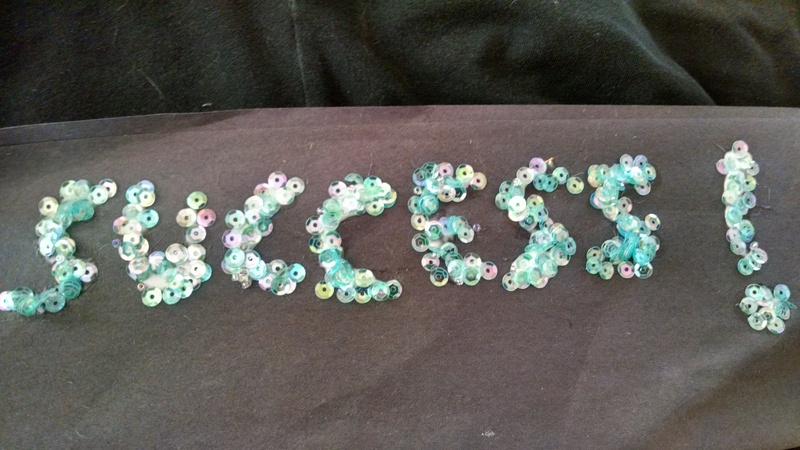 If you link enough small victories together, it will be a success. Perhaps not the one we fantasized about, but as you showed in your article, real successes come from touching others. You are so right, Cathleen! Congratulations on your publication, and may you enjoy many more victories!